Oracle Racing is to field two crews in the inaugural America’s Cup World Series, to be eld in Cascais, Portugal, over 6-14 August. These will be headed by James Spithill and Russell Coutts, respectively the youngest skipper and the most successful skipper in the 160-year history of the America's CUp. Round 1 of the new America’s Cup World Series will see the first competitive clash between Oracle Racing and the challenger teams. There will be added zest with rivalry between the team’s two crews. The Oracle Racing Spithill crew includes tactician John Kostecki (USA), wingsail trimmer Dirk de Ridder (NED), headsail trimmer Joe Newton (AUS) and bowman Piet van Nieuwenhuijzen (NED). Spithill’s ‘young guns’ count five America’s Cup wins between them. “We are extremely competitive and we are judged by our results, so I want to do everything possible to achieve this,” said Spithill. By contrast, four of the Oracle Racing Coutts veterans total a record-breaking 15 Cup victories, boosted to 16 when the team’s youngest sailor Simeon Tienpont’s 2010 win is counted. The Oracle Racing Coutts crew includes tactician and wing trimmer Murray Jones (NZL), headsail trimmer Simon Daubney (NZL), pitman Matthew Mason (NZL) and Tienpont (NED), the bowman. 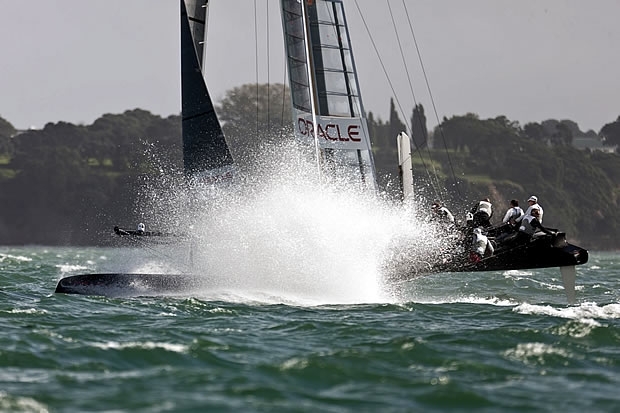 As the lone defender candidate, Oracle Racing has two complete in-house crews to hone its skills. The team is coming off a month-long training session at its base in San Francisco, host venue for the 34th America’s Cup in September 2013. Spithill, Kostecki, de Ridder and Newton were aboard the trimaran USA 17 when it won the 33rd America’s Cup. Bowman van Nieuwenhuijzen joined the team last September. Coutts’ crew includes old mates Daubney, who joined the team last month, Jones and Mason. Oracle Racing’s two AC45 catamarans are en route from the USA to the venue in Cascais, Portugal. The two crews hope to begin practice sessions on 3 August.